Devon Miller (no. 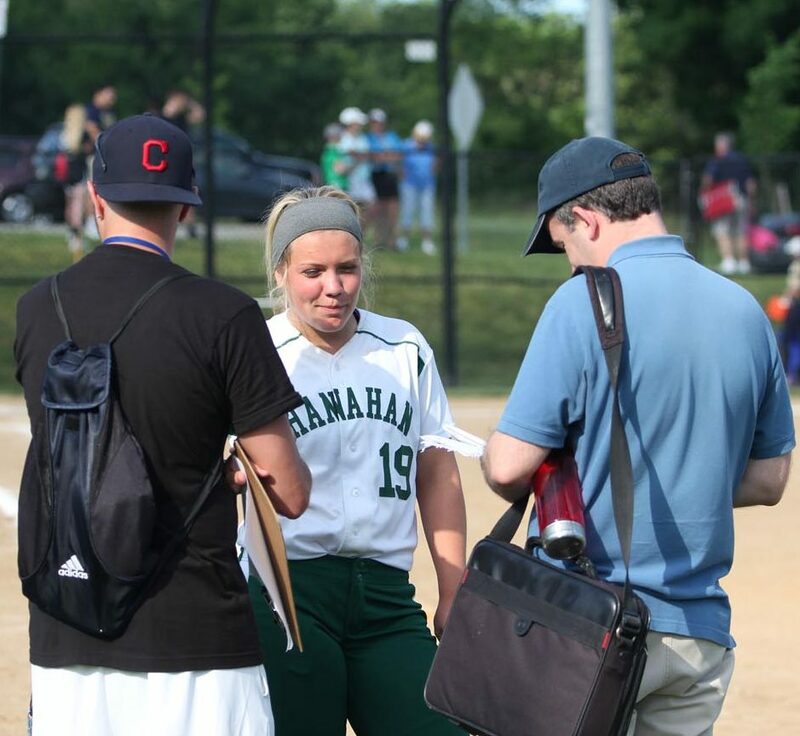 19, center) walks off the field with a smile and a win against Upper Merion in the PIAA District 12 softball semifinal game last month. She pitched a complete game shutout with eight strikeouts and drove in four runs with a single and a bases-loaded double in the 10-0 victory. 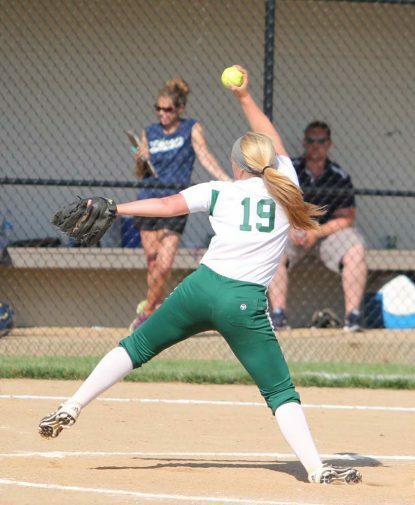 Devon Miller shows her winning form on the mound for Bishop Shanahan High School. 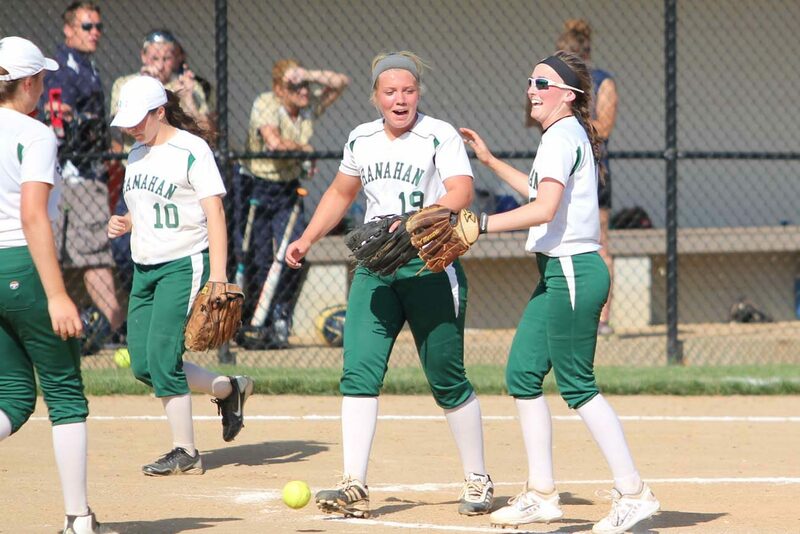 The Bishop Shanahan Eagles’ softball team enjoyed a great 2016 season. Much of the success could not have happened without freshman pitcher Devon Miller of Chadds Ford, who transferred to the archdiocesan high school in Downingtown from Kennett High School this past January. It has been a long road for Miller – literally – since she began playing softball at age 6 for her Kennett-area Little League team. Year-round tournaments nearly every weekend involve plenty of traveling with her Chaos Softball squad in the U14 Futures travel team. Miller has made her way through Pennsylvania, New Jersey and New York. She played in a tournament in Boulder, Colorado and has also had the opportunity to spend time in Orlando, Florida. Some of these trips have proven to be stiff competition for Miller and her teammates as many opponents are among the best teams in the United States. Miller would not have developed her talent for softball without the guidance and support from her parents, Todd and Laurie Miller. They have practiced with their daughter ever since she expressed interest in the game. As an only child, Devon holds a close bond with her folks. Devon Miller is as good a hitter as she is a pitcher. “My dad has pushed me to be the best,” she said. Her parents have also shown support by accompanying her on those countless weekend trips. In addition to the players, parents have been given a wonderful opportunity to grow closer with each other on these trips. When the teams are on the road but have free time to spare, there is plenty to do such as take in a movie, go on a shopping spree, visit a museum or go out to lunch or dinner, among many other choices. Even when a tournament is delayed or cancelled due to inclement weather or another serious reason, there are always ways to work around the change in the schedule. “There are plans for if there is a delay between games,” said Todd. But there is more to Devon than softball. While attending Kennett High School she began looking for a better learning environment while continuing on with her beloved sport. She made the switch to Bishop Shanahan shortly after the Christmas break and knew right away it was the right call. It did not take long for Devon to put her athletic talent to good use at her new school. She started practicing with the Eagles in January. Even as a high school freshman, Devon Miller gets used to interviews by sports reporters. While it was not an easy start to the season, the Eagles realized it is not about how they start but how they finish. They began the year with a 0-8 record but things turned around. Shanahan picked up its first victory against Kennett. One of Miller’s greatest games this spring was when No. 11 Shanahan took on No. 2 Upper Merion in the semifinal round of the District One Class AAA playoffs and emerged with an amazing 10-0 shutout. As a result, the Eagles earned their place in the district championship game along with a trip to the PIAA state tournament. Miller came through on both offense and defense in that crucial game. She fanned eight batters on the day. Offensively, she hit an RBI single as well as a double that cleared the bases. Then it was on to states. Bishop Shanahan defeated Archbishop Wood in the opening round before dropping a decision to Abington Heights in the quarterfinals. While summer vacation from school is underway, life hasn’t slowed down for Devon and her parents as there is Chaos Softball action every weekend. What lies ahead for Devon? 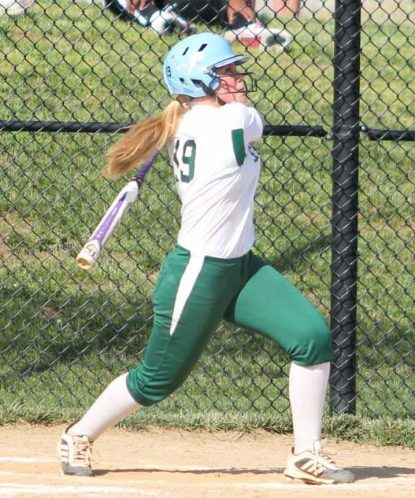 She plans to continue playing softball through high school and onward, attending a college or university in the South, particularly somewhere in Florida where she would like to pursue one of her long-term goals. The Millers have plenty of experience with traveling for softball. However, as Devon approaches the next chapter of her life, they will rack up more mileage as she searches for the right college.